Reccomended by:Let's Go Travel Guides, The Rough Guides and Frommers Naples and Amalfi Coast. 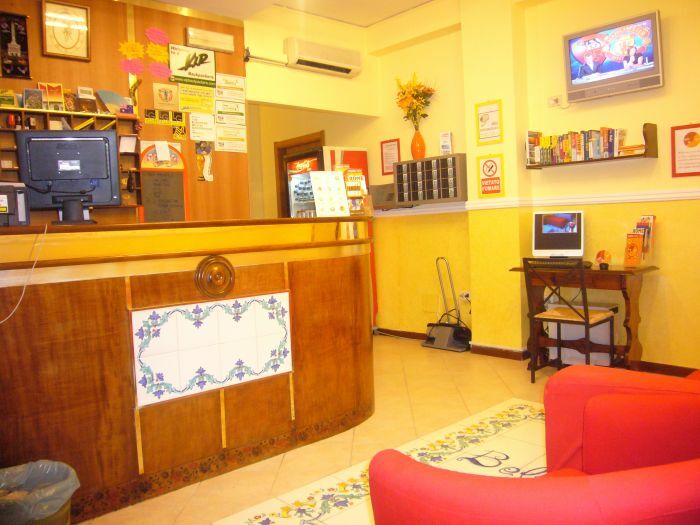 Hostel and Hotel Bella Capri is a clean, friendly and safe backpackers accomodations located in the most central part of Naples. 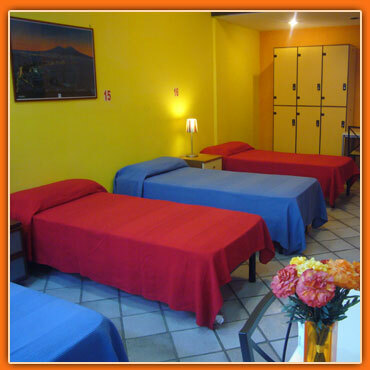 Large shared rooms with free lockers. Private rooms ensuite or with shower on the corridor. Some rooms(ONLY ON REQUEST! 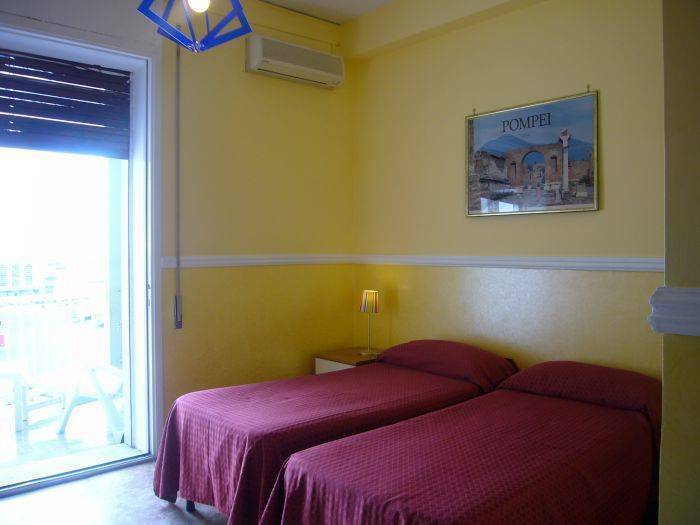 )with a large terrace with a nice view on the Bay of Naples with Mt. Vesuvio, Sorrento Coast and Capri Island. Large common room with TV. English, Spanish, Polish and Greek spoken lenguages. Shared rooms ensuite with free lockers. Shared rooms with bath in the corridor. Right in front of the Port for ferries and hydrofoils to:Capri, Ischia, Procida, Sicily, Sardinia, Tunisia and Aeolie Islands. Only 2 minutes by walk to the "SITA" Bus station to Pompei, Sorrento, Positano and Amalfi coast. Castel Nuovo(or as Neapolitans call it.... "Maschio Angioino")is just beyond the Hostel as Royal Palace and Gallery Umberto 1th. National Archeological Museum(Pompei Museum)at 15 minutes by walk from us. Restaurants and ATM machines near by. San Carlo Opera House 30 mt. Gallery Umberto 1th. 30 mt. National Archeological Museum 2 km. Ferry and Hydrofoils to Capri 10 mt. Bus to Pompei and Amalfi Coast 10 mt. 10% discount only for travellers with Travel Guide books such as:Let's Go,The Rough Guides and Frommers Naples and Amalfi Coast. Cancellation with no charge has to be made by fax or e-mail within 48 hours before the arrival day. take a walk to the Bus station(Located in the centre of Piazza Garibaldi)and take the Bus R2. This will drive you trough the main shopping street Corso Umberto and then turn into Via De Pretis. Get off at 2nd. stop of Via De Pretis and cross the road into Via Melisurgo N°4(at corner you will see a newspaper Kiosk). Take a short walk (1 min. )into this street and at the end of it on your right hand side you will reach us. as soon as you will go out from arrivals, you will find the "ALIBUS" shuttle which will drive you downtown. You have to get off at last stop which is Piazza Municipio(right near by the Castel Nuovo). Then you have to face the port and turn on your left hand side into Via Colombo and within two blocks you have to turn left again and you will find us. From Naples central train station Bus R2 and Stp in Via De Pretis. In alternative Bus 152 and Stop in Via Colombo right in front of the Port. From Naples International airport Alibus and get off at last stop Piazza Municipio. In alternative Bus 3S and get off at Via Colombo right in front of the Port. Nearest airport: Capodichino International Airport.